Having successfully bamboozled their way through a series of political encounters over the past few years, downtown’s reactionary business class proved yesterday that they’re in no mood for any compromises. With hours of a Council president Todd Gloria introducing a revamped minimum wage proposal the Chamber of Commerce’s newest front group, calling itself the San Diego Small Business Coalition, mustered a couple of dozen bodies in front of city hall to denounce the compromise proposal as ”massive,” threatening increased prices and reduced employment. Gloria’s scaled-back proposal increases the local minimum wage in three annual increments. Stage one (originally $11.09) would be $9.75, stage two (originally $10.50) would be $10.50 and stage three (originally $13.09) ends up at $11.50, effective January 1, 2017. Allowing employees to earn paid sick days is also part of the measure. The start date for indexing future minimum wage increases would be pushed back from July 1, 2017 to January 1, 2019. The current minimum wage in California is $8.00, which will increase to $9.00 on July 1, 2014 and to $10.00 on January 1, 2016. The revised proposal was crafted by Gloria’s staff following a Chamber of Commerce sponsored press conference last week at a downtown retailer. Ace Hardware store owner Harry Schwartz, the star of the initial anti-increase event, appeared yesterday at City Hall in support of the revised proposal. Compromise, or even appearing to be reasonable wasn’t what what the downtown types had in mind, as last week’s Chamber of Commerce small business hero was airbrushed out of the picture. The City Council will now decide whether to enact the proposal by ordinance or by placing it on the November ballot. The forces opposed to any increase in the minimum wage have indicated their willingness to seek a referendum repealing any expansion should the council decide to act in a direct fashion. Given their track record of success in misleading, scaring or simply lying to voters going back to 2012’s pension reform initiative (Republicans insist on falsely claiming that savings are having an immediate impact), it doesn’t surprise me that opponents are taking a hard-line stance. I’m sure they’ve already polled the issue and are ready to start spinning yarns as needed. 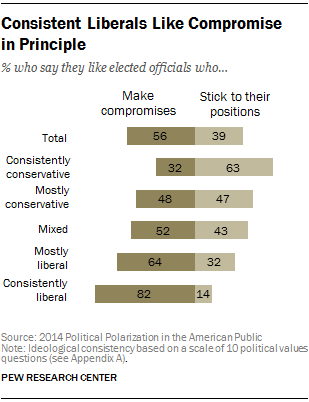 Plus, as the Pew Poll graphic on this page shows, compromises just isn’t part of the conservative makeup. San Diego’s downtown reactionaries believe they’re in control. Elections no longer are a concern because they’ve proven they can confuse just about any issue enough to win in low voter turnout elections. It’s the new plutocratic version of democracy, where the “free speech” of unlimited money drowns out reasoned debate. Of course, there is one way to beat them….but that would involve actually showing up and casting a vote. The Los Angeles Times has a story today about California’s Alpine County, where voter participation has been maximized by using a comprehensive vote-by-mail system — every registered voter receives a ballot in the mail, not just those who request them. The sparsely populated county instituted the universal ballot system back in 1989 in response to voter frustrations with not being able to reach polling places because of deep snow. Nearly everyone in this community along the crest of the Sierra Nevada — carved through graceful, tall pine groves and mountain peaks, halfway between Lake Tahoe and Yosemite — makes their mark on election day. On June 3, in one of the least compelling gubernatorial primary elections in memory, nearly 70% of voters cast ballots, the largest turnout per capita in the state. California as a whole is on track to hit a record of a more dubious nature — 18.3% of voters cast ballots through election day on June 3. Absentee and provisional ballots are still being counted, but voting experts expect the state to end up with a turnout of 22% to 23% — far less than any in recent history — when the tally is finalized in early July. That’s a roughly 10-point drop from the last gubernatorial primary, part of a long-term trend in California, where fewer voters are casting ballots in primary elections as more choose not to affiliate with a political party. The Times account also notes the two states (Washington & Oregon) exclusively offering voting by mail have higher turnouts than California. Cynara Velazquez of the California Voter Project recently emailed me some very intriguing analysis of initial turnout results from the registrar of voters that seems relevant here. 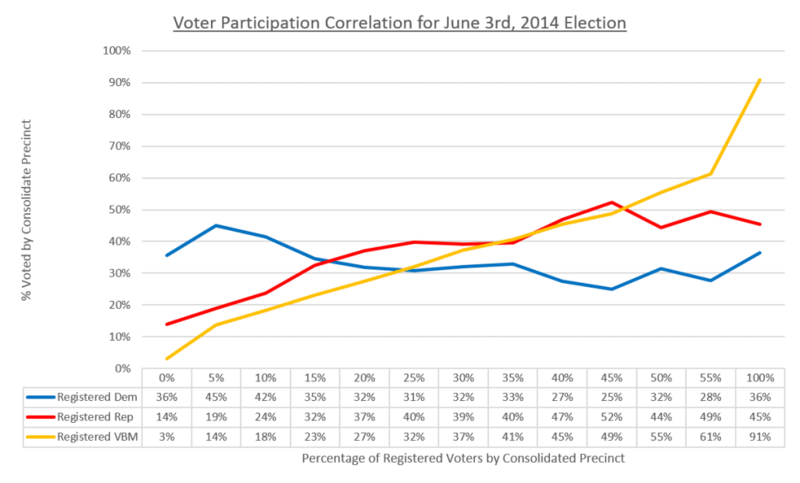 It suggests that the means by which people vote is more important party registration. Since Republican candidates did especially well in this election, there have been statements in the media that this is due to the fact that Republicans voted in the primary election and Democrats did not. While this may be true (we will not know until the Registrar of Voters publishes their final tallies on or before July 3rd), it remains an open question if party affiliation was the primary factor in who determining which voters participated in the 2014 primary election. In this election, absentee voters voted at a rate of 26%, while poll voters voted at a rate of only 14%. Therefore, it could be hypothesized that voter turnout was more dependent on whether a voter was registered to vote absentee vs. on the day of at the polls, than the party affiliation of the voter. This could also explain why Republican voters voted at a higher rate in the primary election since, since a higher percentage of Republican voters are registered to vote absentee than Democratic voters. Just a thought here… Maybe the concept of “get out the vote” that Democrats have traditionally been so good at when it comes to in-person voters needs to be redesigned. UT-San Diego and 10News recently paid for a poll showing Carl DeMaio with a strong lead over Representative Scott Peters in the race for the 52nd Congressional District. As the UT noted in their on-line subhead, there’s a long way to go until the November elections. CA-52: A new SurveyUSA poll finds Democratic Rep. Scott Peters trailing former San Diego City Councilor Carl DeMaio by a 51-44 spread, which certainly looks bad for Peters. A year ago, SUSA put DeMaio up 48-39, so while the margin has narrowed, DeMaio’s now crested the 50 percent mark. However, there are a few issues here. In California’s recently concluded primary, Peters took 42 percent of the vote. If he only performs 2 points better in November, that would be a remarkably small increase compared to the kinds of jumps in Democratic performance we saw between the primary and the general in 2012. Yes, the fall surge will be smaller for Democrats in a midterm year, but the smallish 5-point bump in CA-52 last time was at least partly due to the heavily contested fight between Peters and fellow Democrat Lori Saldana, something we didn’t have this time. What’s more, at least 90 percent of SUSA’s respondents said they voted in the June 3 primary, which is just way too tight a screen. Last cycle, by contrast, primary turnout was just 51 percent of general election turnout. That ratio will likely be higher this year, but not as high as SUSA imagines. Again, since the fall electorate will almost certainly be more friendly toward Democrats than the primary electorate was, a sample like this is going to be too tilted toward Republicans. Finally, there’s SurveyUSA’s well-known odd behavior, where a lot of their mid-cycle polls look weird but often come into line shortly before election day. Indeed, we just saw this happen in this very same area late last year and early this year during the special election for San Diego mayor. SUSA’s polling bounced back and forth wildly, repeatedly alternating between a tight race and big leads for Republican (and eventual winner) Kevin Faulconer. So their track record is one to be wary of. When Carl walks by in the 2014 PRIDE Parade, turn your back on Carl just as he has turned his back on you. Let voters in the 52nd District and County-wide know what you think of Carl DeMaio. No doubt Carl will soon be running to his friends at Fox News waving flyers for this demonstration as proof of the vast leftwing conspiracy against gays. While we’re on the subject of conspiracies, word has it that DeMaio’s significant other is facing ouster as president of the Hillcrest Business Association. An email circulating this morning is calling on people to attend the HBA’s 5pm meeting tonight at the Joyce Beers Community Center to support photographer and businessman John Thurston and others as they call for Jonathan Hale’s immediate resignation. Apparently Hale has held 25 HBA Board and Board Committee meetings in his own University Avenue offices for his personal convenience since he was elected as HBA President last Fall, rather than in HBA’s own ADA- compliant offices or an ADA compliant public meeting place . Because the HBA is explicitly covered by the California Brown Act by its own By-Laws and San Diego’s enabling ordinance creating the HBA , it is required to hold all its Public Board and Board Committee Meetings in an ADA- compliant facility. Hale’s second floor office is not ADA compliant. I’ve asked for the rights to the popcorn concession. Both UT-San Diego and NBC7 have been pursuing, via the state’s public record request law, a copy of a letter of recommendation Bonnie Dumanis wrote for the son of a foreign tycoon at the center of a campaign finance scandal. The letter in question was written to the University of San Diego on official stationary and came to light during a June 2nd federal court hearing. UT-San Diego asked County Supervisors for access to letters of recommendation they’d written, getting cooperation from Diane Jacob, Bill Horn, Dave Roberts and Greg Cox. Most of the responses came a day or two after the Watchdog made a formal request under the state Public Records Act for the letters. 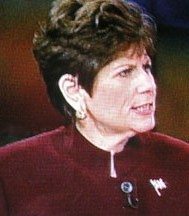 Dumanis took the full 10 days allowed by law to reject the Watchdog’s request. The U-T asked Dumanis on June 2 for a letter she had written on district attorney letterhead on Sept. 28, 2012, to the University of San Diego on behalf of the son of Jose Susumo Azano. Azano has been charged in a federal probe of foreign money flowing into local campaigns in 2012, including Dumanis’. The DA refused to produce the Azano letter because she said it did not concern public business, and therefore wasn’t a public record under the law. She cited three other reasons: the privacy rights of the son, federal education privacy laws, and that the letter is covered under a protective order in the federal criminal case against Azano that keeps it sealed. Dumanis has declined to discuss the letter, stating it is subject to an ongoing criminal probe. Previously, she said she barely knew the Mexican businessman multi-millionaire Azano. She has also said that she couldn’t remember when they met and that she had no idea why he donated $200,000 to support her mayoral bid. NBC 7 has also learned more about the origins of that letter. In an exclusive interview, Azano’s attorney claimed that neither his client nor his client’s son asked Dumanis to write that letter. Attorney Knut Johnson also said Jose Azano did not know about the letter until it was produced to the defense as part of the federal criminal case against him. Johnson told NBC 7 that Azano’s son, Edward, has never read the letter and does not have a copy of it. Johnson said Edward Susumo Azano was given a sealed copy of the letter, which he submitted to USD as part of his admissions packet. “And those facts alone help exonerate (Jose Azano),” Johnson said. On This Day: 1873– Susan B. Anthony went on trial in Canandaigua, N.Y., for casting her ballot in a federal election the previous November, in violation of existing statutes barring women from the vote – 1932 – The U.S. Senate defeated the bonus bill as 10,000 veterans massed around the Capitol. 1964 – The Supremes’ “Where Did Our Love Go” was released. It became their first song to get to number one on the Billboard Hot 100 pop singles chart. Let’s just push back the date for implementation of the minimum wage increase, do it in stages and water down the amounts. Why even bother to increase it at all? If they really wanted to increase the minimum wage, they could do it tomorrow. Typical politicians – they want to have it both ways. They want to convince the constituency for the increase that they are doing something while in reality they are doing nothing. That appeals to the other side.